Finally, I think one of the biggest issues is that Howard may have misrepresented his research in the Chessbase.com article. Since the full paper is behind a paywall, I don't know for sure or to what extent, but there are certainly indications that the article overstates Howard's conclusions. The graph purportedly refutes the participation hypothesis by showing that the rating gap between males and females increases as the female participation rate increases. This supports Howard's alternative hypothesis that the most talented females are already playing no matter how low the overall female participation rate is, and that increasing the participation rate only adds less talented players and can never catch females up to males. A few things jump out about this graph, though. 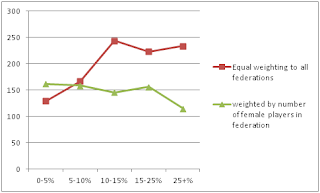 First, the data on federations between 5-10% and 15-25% is completely missing from the graph, with the three remaining points forming a neat line with a clear slope. I have no idea if this was deliberate, but it is at least strange. More importantly, Howard doesn't explain anywhere in his summary how the data is aggregated, how many players are included in each group, what countries are included in each group, how any individual federations rated, or why this particular graph was chosen out of the various studies or various number-of-games controls Howard seems to have run. Howard singles out only Vietnam and Georgia as countries with high female participation in the text of the article. Except when I downloaded the April, 2015 rating list, the difference between the average male rating and the average female rating in Vietnam (94 points) was significantly lower than the difference worldwide (153 points). And Georgia (35 points) had one of the smallest gender rating gaps in the world. I don't have data on the number of games played to check what happens when you include that control, but as I wrote in the previous post, I am skeptical that that could possibly cause the rating gap for Georgia or Vietnam to suddenly jump above average. 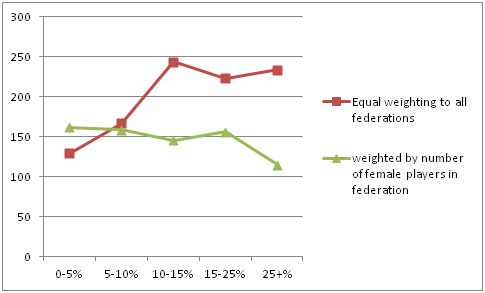 What countries with high (25+%) female participation rate among FIDE-rated players had higher than average gender gaps? Ethiopia had a massive gap, with the average male rated 621 points higher than the average female. But there are only 30 Ethiopian players on the list, with just 9 females. Most of the other countries with a high percentage of females on the rating list that had above-average rating gaps also had very few players. So it could be that Howard's graph is aggregating the data in a misleading way. I don't know for sure, but his results look a lot more like what I get when I aggregate the data in a misleading way. It is also possible that setting a control for players at 350 rated games played left relatively few players, and that after further splitting up the data into separate federations like this, there are simply not enough data points to get reliable results. "I also tackled the participation rate hypothesis by replicating a variety of studies with players from Georgia, where women are strongly encouraged to play chess and the female FIDE participation rate is high at over 30%. The overall results were much the same as with the entire FIDE list, but sometimes not quite as pronounced." "Howard debunks this by showing that in countries like Georgia, where female participation is substantially higher than average, the gender gap actually increases – which is, of course, the exact opposite of what one would expect were the participatory hypothesis true." "I don’t know what Short is referring to here, because there is nothing in the Howard article that suggests this. Figure 1 of the study shows that the gender gap is, and has always been, lower in Georgia than in the rest of the world for the subsamples tested (top 10 and top 50). Short may be referring to Figure 2, which, to be fair, probably shouldn’t have been included in the final paper. It looks at the gender gap as the number of games increases, but on the previous page of the article, Howard himself acknowledges that accounting for number of games played supports the participation hypothesis at all levels except the very extreme." "...This supports a nurture argument to the gender gap, but again, the sample size is too small for anything definitive to be concluded." This sounds like it is describing completely different research from Howard's Chessbase article. While Short definitely did not do himself or the gender discussion any favours with his interpretation, neither does Howard do his research justice with his published summary.